← Celebrating Four Years of CollectingCandy.com with Four Fun Discoveries! Today is the day for the great American tradition of Superbowl Sunday! And as I have done every year since launching this site, I will mark today by sharing some football-themed candy. 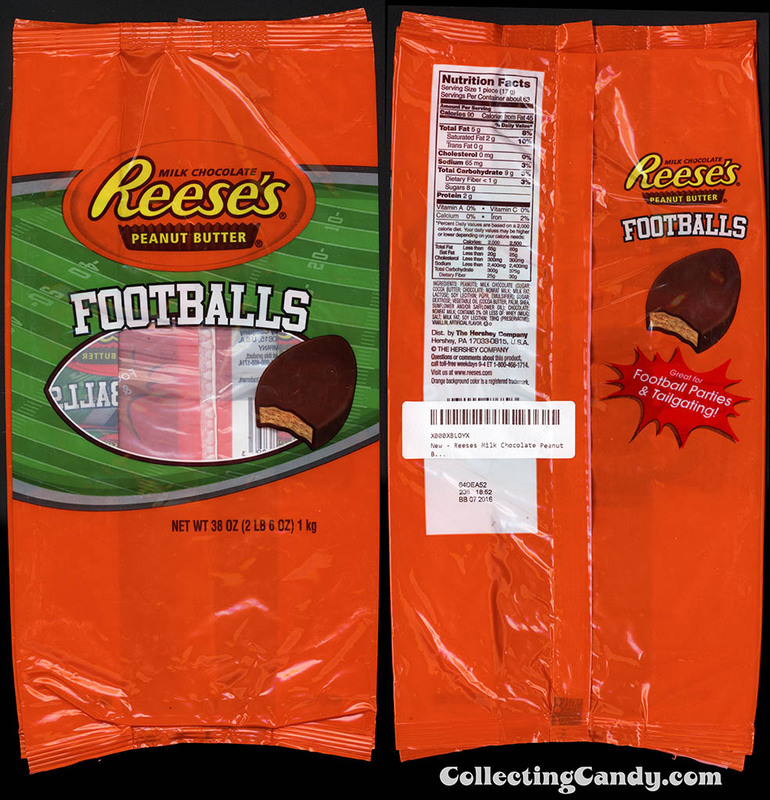 The last few years it’s been all about NFL team-themed Snickers product, but today I’m switching it up by presenting two different styles of Reese’s Footballs – so make the jump to check them out! 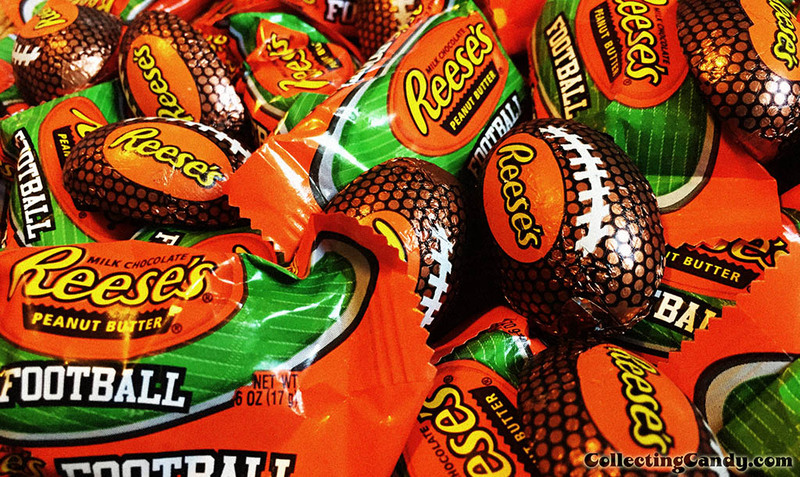 I’ve encountered Reese’s offered in a number of seasonal themes/shapes over the years; hearts, pumpkins, and of course the classic eggs – but I’d never encountered football-shaped Reese’s before. 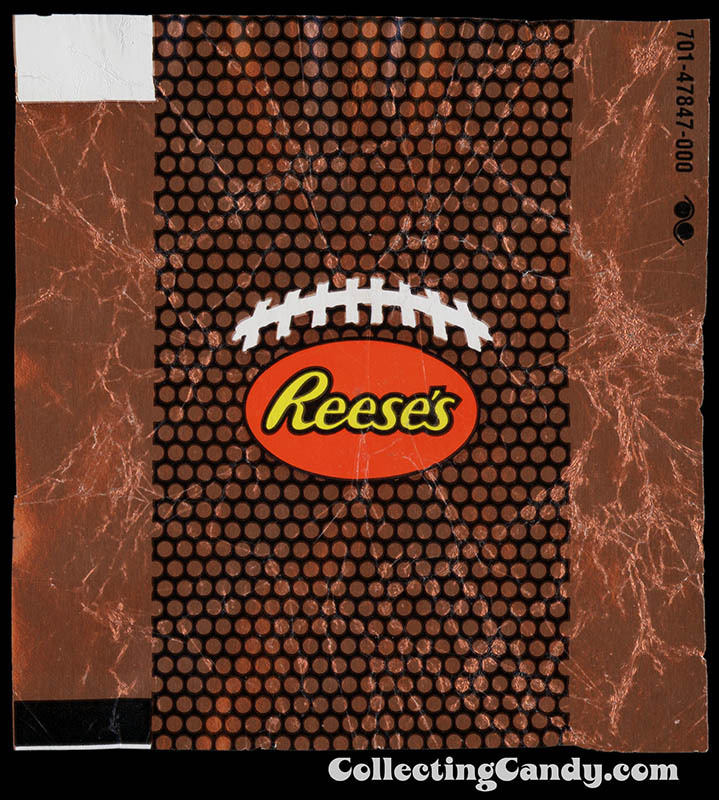 And whereas I would typically find the Snickers NFL-themed offerings in early Fall at the beginning of the football season, I only discovered these Reese’s football products during the last several weeks. 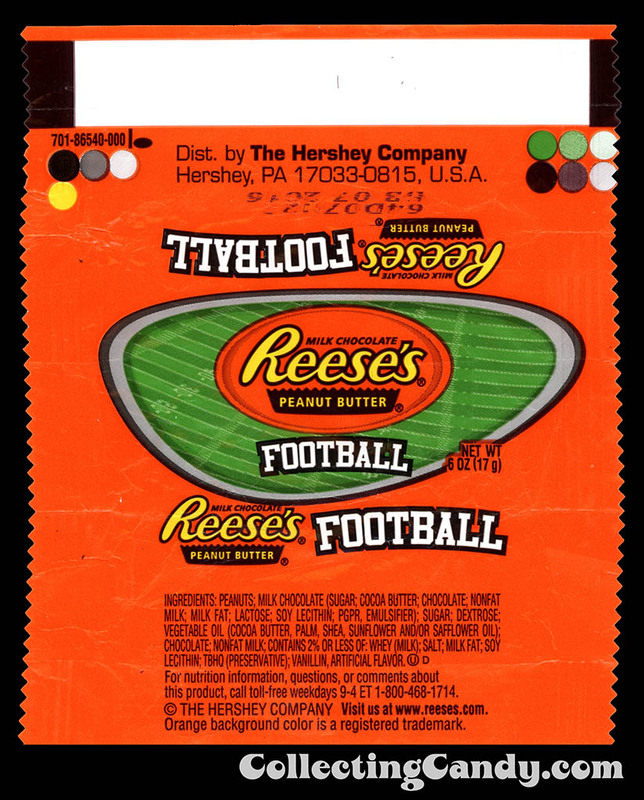 After picking those up, I assumed that was everything I had to discover regarding Reese’s football-themed product, but there was more. Each of these two football-shaped offerings is its own unique thing, and while neither really looks all that much like a football once they’re unwrapped, I can forgive them this detail. To my eye these appear to be pretty much the exact same shape as the two different versions of Reese’s Eggs that are typically available for Easter season. But lets be honest, these are Reese’s peanut butter and chocolate – does it really matter what they look like once you unwrap them? I think not. They are delicious. 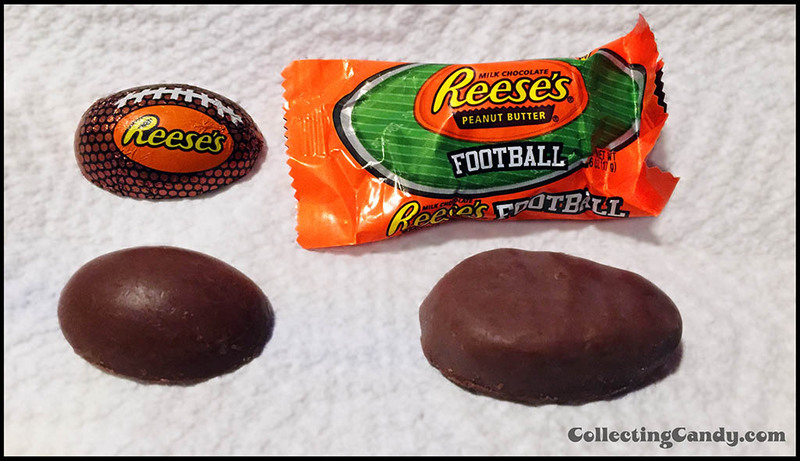 And that’s all I’ve got to share today on the two distinct forms of Reese’s Footballs. Time for me to get back to my Superbowl prep. If you’re wondering, I’m not really a fan of either team, but I’m rooting for Peyton Manning to end his career on a high note. We shall see if he does. Mostly I just hope it’s a good game. This entry was posted in Chocolate, Hershey, Holiday, Peanut Butter and tagged candy collecting, candy collection, candy collector, candy wrapper collection, candy wrapper collector, collectible, collecting candy, confectionery, confections, packaging, packaging design, sweets, vintage candy wrappers, wrapper. Bookmark the permalink. 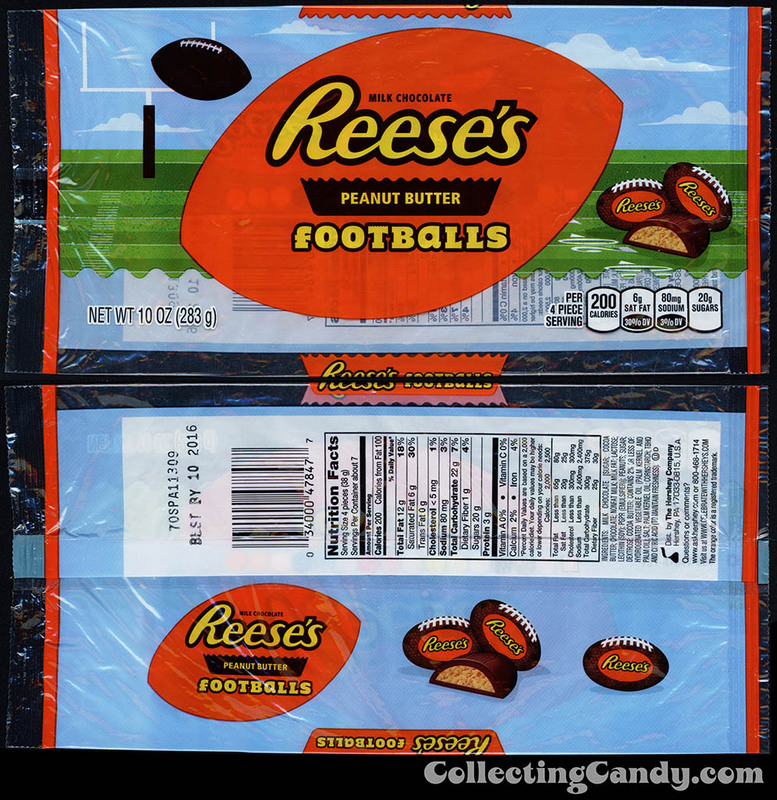 1 Response to Reese’s Footballs for Superbowl Sunday 2016! Thanks so much for posting this. I know this is so dumb but I just ate 2 of these and was wondering what the calorie info was and…I couldn’t find it anywhere actually listed the same across all sites. It’s blogs like this that make the internet awesome.